The National Garden Bureau has designated 2016 as the year of the allium! To celebrate, I have partnered with Longfield Gardens to design two perennial boarders highlighting the unique spring explosion of these rounded blooms. I frequently include allium bulbs in my perennial border designs for their color, which goes with my typical cool palette, deer resistance, and unexpected texture. Since alliums are spring bulbs you plant in the fall, we’re sharing our first design now during its bloom; the second we’ll reveal in the fall, during planting season. The bulbs and peonies included in this first design are available to purchase directly from www.longfield-gardens.com along with all the images and details of the design. Inspiration: The highlight of this garden is the rich jewel-tone blooms, which are a reprieve from the pastels and bright sunny hues often associated with spring gardens. The spherical, fluffy heads of alliums sway above the heavy, lush peonies in a dense English garden-style border. Rich fuchsia, amethyst and mauve-hued blooms are grounded by the shocking chartreuse foliage of the lady’s mantle (Alchemila mollis). The design also incorporates low-maintenance perennials like Dwarf Catmint (Nepeta x faassenii), ‘Caradonna’ Sage (Salvia nemorosa) and ‘Little Spire’ (Perovskia atriplicifolia) to extend the beauty of this garden well past spring’s blooms. What excites me most about this partnership is the ability to implement the design. You get the knowledge of the supplier, designer and installer all in one design. 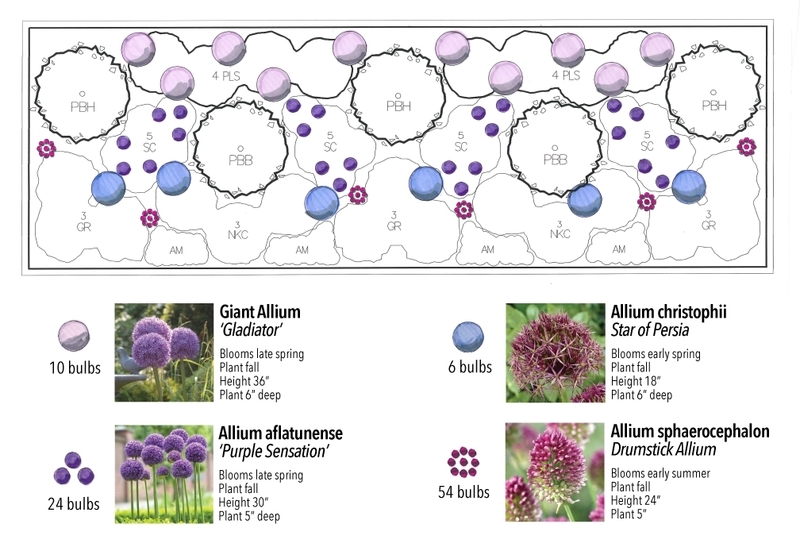 I’ve shared all of the planting steps and tips for installing this garden design below, but be sure to visit Longfield Garden’s site for additional details, allium varieties and other spring flowering bulbs. FALL. 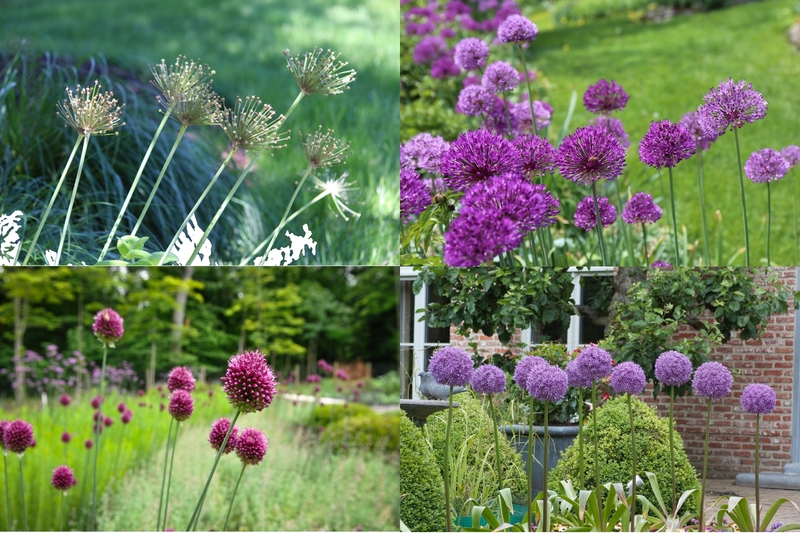 You can order your alliums starting in September from Longfield Gardens. Plant the bulbs once the ground has started to cool, which for us is normally mid-October to beginning of November. If they’re planted too early, the warm soil will rot the bulb. Peony ‘Bowl of Beauty’ and Peony ‘Bunker Hill’ – These plants are shipped bare root. When your plant arrives, store in a cool dark location until you are ready to plant. Alliums ‘Gladiator‘, ‘Purple Sensation’, christophill and drumstick – When these arrive as bulbs from Longfield in early September, store in a cool, dark location until you are ready to plant. Lady’s Mantle, ‘Caradonna’ Sage, Cranesbill, Dwarf Catmint and Perovski ‘Little Spire’ – Look for these perennials at your local garden center in 1-2 quart containers. They may offer larger sizes, but larger size does not guarantee better growing success, will cost more and require more work planting. When selecting the location for your border, look for a place that gets full sun. I recommend a location that gets really good southern light. These plants all do great up next to the house, along a driveway or along the property edges. Once you have your location, prep the bed by tilling the soil and adding an organic matter. I use leaf compost made from the previous year’s clippings, but you can purchase a similar product from your local garden center. You want to make sure you are providing the best soil for the plants that drains well and has plenty of nutrients to help them establish and grow. When you have your bed prepped and plants purchased, use the design as a guide and place the plants still in their containers on the bed. This allows you to work out spacing before you start to dig. Start in the center of the bed and work out to the ends. If your bed is narrower or deeper that our 10ft x 18ft design, this will give you a chance to make some changes in spacing. Once you are happy with your placement, you can start planting. If your design is against a building, start at the back and work forward. You want to plant in the harder to reach areas first and work your way out. Regardless of where you are planting, I recommend planting the peonies last. You need to ensure that the eye of the plant is not placed more than ½- inch below the soil surface or you will not get prolific blooms. When you have everything planted, provide each plant with a deep watering. You can use a small overhead sprinkler. Proper moisture is the key to establishment. I do the finger test, stick your finger in the soil. If soil sticks to it, you are fine. If not, it’s too dry and you need to water. After everything is watered you can go back and cover the bed with a leaf compost mulch. Keep the layer no more than one inch thick and a ½-inch ring away from each plant stock. The first year your garden will look good, the second year will be better, but the third year and beyond will be the ultimate pay off for all of your hard work. For the first summer, cut back the plants a 2-3 times and deadhead after blooming. Since pushing blooms takes a lot of energy for the plant, cutting back blooms will send that energy into fortifying its root system instead, establishing the plant earlier. Over the summer keep an eye on the plants to make sure they are getting adequate water (use finger test). Use our bulb design for helping with placing the bulbs; you can place the bulbs before digging each hole to ensure you’re happy with your spacing. We use a 4-6 inch auger bit to drill holes for the bulbs, but you can also use a hand shovel. Once you dig a hole, place bone meal as a starter fertilizer at the bottom of the hole. Once all the alliums are planted, you can place chopped up yard leaves over the bed. I prefer to cut back my perennials in the spring. The following spring, keep your eyes open for the allium breaking through with the rest of your perennials. The alliums will require little to no maintenance from you. After the blooms are over, you can either cut back the stocks or keep the dried seed heads in the garden for their extra texture. For the bulbs, allow the foliage to die back naturally and you can pull by hand. This will ensure the bulb has stored enough energy/food for the next year. Phew! I hope I provided all the details needed to give everyone the confidence to plant the design. Please let me know if you have any specific questions, I will be glad to help answer. Longfield created a great information sheet to print and use when planting and purchasing the plants (See Below). Also, Longfield Gardens has created a great landing page with the design and the ability to purchase the alliums and peonies directly. 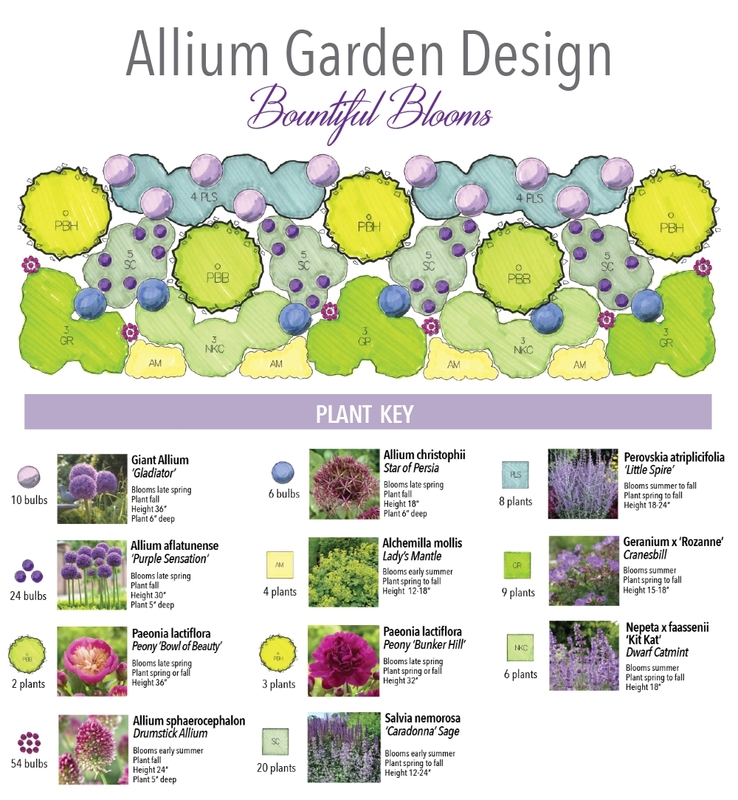 In September, we will release the second design just in time for ordering your allium bulbs. Angela Rose writes about alliums at The Freckled Rose. Jason Kay writes about alliums at Garden In a City. Robin Horton is writing about alliums at Urban Gardens. This entry was posted in Landscape Design, Perennials and tagged allium, Allium 'Gladiator', Allium 'Purple Sensation', Allium christophii, Allium sphaerocephalon, Drumstick Allium, garden design, Giant Allium, landscape design, landscape designer, Ohio, perennial design, perennial plants, perennials, Plant Combos, Year of the Allium by Nick. Bookmark the permalink. If I had enough space in my garden, I would definitely grow this botanical garden like this one! It looks so amazing! The color mixes well together!